Take a look at South American Exotic wood species at FERMA Flooring. Want South American Exotic floor? Take a look at South American Exotic wood species at FERMA Flooring. In the wood flooring industry, Jatoba is known to be one of the strongest and durable species available exotic species. The sapwood color of the Jatoba exhibits some gray-white. The Jatoba heartwood color varies from salmon red, orange-light brown color when fresh to a reddish darker brown color after drying. Dark streaks on the finished Brazilian Cherry hardwood floor is a common feature. A huge canopy tree native to the Caribbean, and South America region. Though it’s commonly referred to as Brazilian Cherry, it is in no way related to the common Black Cherry tree in North America. In the South American region, Jatoba is also known as South American Locust, stinking toe (because of the fume of its seed pod), and various other names. Brazilian Walnut is one of the, if not the densest hardwood flooring in the flooring industry. It is seen as a perfect type of wood for high traffic area because of its chart-topping toughness on the Janka test. However, Ipe wood also exhibits problems such as sanding and finishing, so it is generally not recommended for consumers to buy unfinished Ipe. At FERMA, we finish our Ipe with the high industrial standard, so rest assured when buying FERMA Brazilian Walnut floor. Brazilian Walnut floor can vary greatly in color from light yellowish-tan with green overtone to a blackish brown like chocolate color. Because of its extreme hardness, Ipe wood has risen dramatically in demands in the past decades, and even raised environmental concern in the 1990s. Ipe trees are large shrub-like trees that grow to about 16-160 feet tall. Ipe trees are also a very notable flower tree which produces flower of various different color. Ipe selected by FERMA all complied with standard governmental policy and are all legally logged. Just like its name implies, Tigerwood Floor has an unique look that exhibits a pattern similar to that found on a tiger. It has a dark orange background accented with bold black strip that will give any home an beautiful exotic look. Because of the natural pattern found on tigerwood hardwood floor, it usually does well to hide marks and daily wears well. Found generally in South America region, and although it shares a common name with its Hawaiian cousin Koa they have very different properties. Brazilian Koa grows around Mexico, Central America, Bolivia and Paraguay and is also known as Zebrawood because of its bold stripes. The tree grows in both wet and dry tropical forests, and can grow as high as 120 feet. Its trunk can also grow to about 5 feet in diameter. Just like its name implies, Tigerwood Floor has an unique look that exhibits a pattern similar to that found on a tiger. It has a dark orange background accented with bold black strip that will give any home an beautiful exotic look.Â Because of the natural pattern found on tigerwood hardwood floor, it usually does well to hide marks and daily wears well. Cabreuva is a native tree to the South American and Brazilian region. Cabreuva trees can grow as high as 150 feet and its trunk can attain a diameter as wide as4 feet. A lesser seen variation of Santos Mahogany, but shares similar property with Red Cabreuva. Brazilian Teak floor exhibits some special colors. When it is cut fresh, its color varies from dark-reddish-brown to purple-brown, but sometimes light yellowish-brown as well. When it gains more exposure as time passes by, the teak become more uniform in color varying from light brown to yellow-brown. Teak hardwood floor has a very fine texture and a very interlocked grain, and the surface feels oily and wax-like. The teak wood is actually so dense that it will not float on water. The Brazilian Teak can grow to be a rather big tree: as tall as 120 feet, and 5 feet wide. A native species to the rich rainforest of South America, and parts of Central America. Cumaru fruits are well known among the local to emit a sweet aromatic fragrance and are used in other industry such as cosmetic; it also carries medicinal value. The Brazilian Maple floor is a unique wood floor that have very fine texture, and a pale-cream color, which makes the wood known as the Ivory Wood among locals. The wood also exhibits distinctive curl marks at varying angle on its pale-cream color surface. Its heartwood can sometimes be a little darker brown-like color. Though Brazilian Maple maintains a look of domestic wood species, it is an exotic wood found in South American region. It is a perfect type of wood for customers who are looking for a more subdued look but with a touch of exotic flavor. The Brazilian Rosewood is an exotic dark-colored wood floor accented with characteristic black strips similar to Tigerwood. Its sapwood can range from yellow-brown to pale pink, and the heartwood is usually pale brown at first but darkens upon exposure to air to a reddish brown which gives the wood a very attractive appearance. The grain of Brazilian Rosewood is irregular and sometimes strongly interlocked and is very finely textured. The Brazilian Rosewood is another native species to the South American region. It is reported to be able to reach a height of about 80 feet, and a trunk diameter of 2 two 3 feet wide. 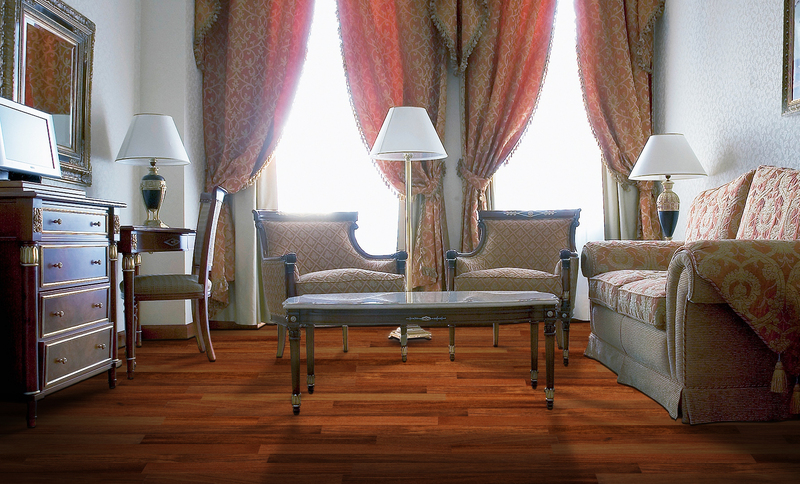 Brazilian Oak offers a rich and lustrous reddish-brown with tan hue. The wood’s yellow-brown tones combined with its luster and wavy grain creates inherent visual warmth. It fits perfectly suited for tan or beige furniture. It has interlocked grain with medium texture and is moderately hard within its South American species. The Brazilian Oak tree can attain a height of over 100 feet, and its trunk can grow to as wide as 4 feet. It is a native in the South American region with scatter growth throughout Argentina, Brazil and South Paraguay.